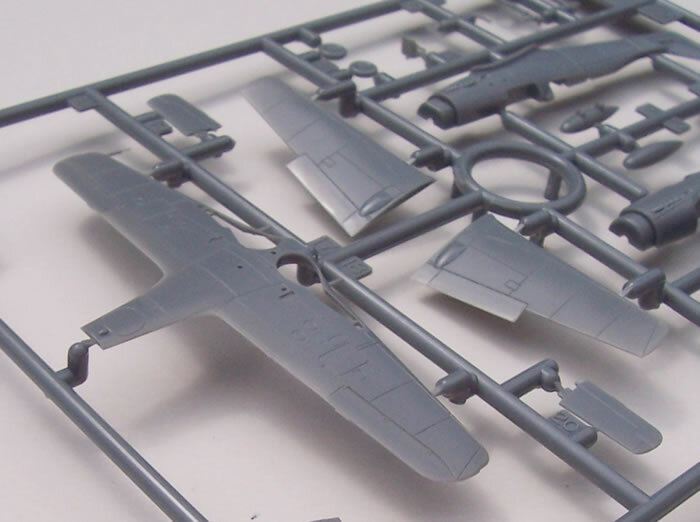 Two kits, each with 29 grey styrene airframe parts, 2 clear styrene canopies and 1 decal sheet for 6 aircraft. Very good quality, high fine mouldings and comprehensive decal sheet. Two kits per box makes for good value. The Fw 190 family needs no introduction amongst most aviation enthusiasts, including the late war in-line engined derivative, the FW 190D. 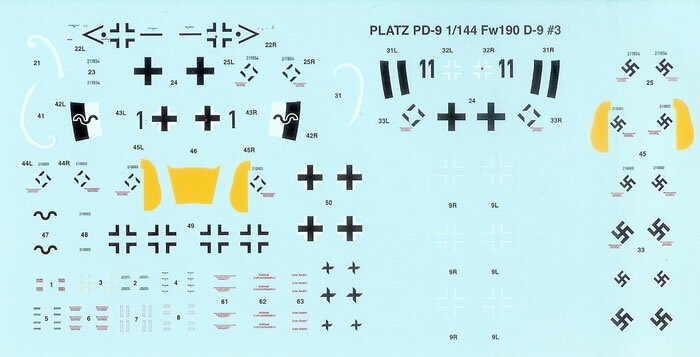 So I shall proceed directly to reviewing the kit recently issued by Platz. 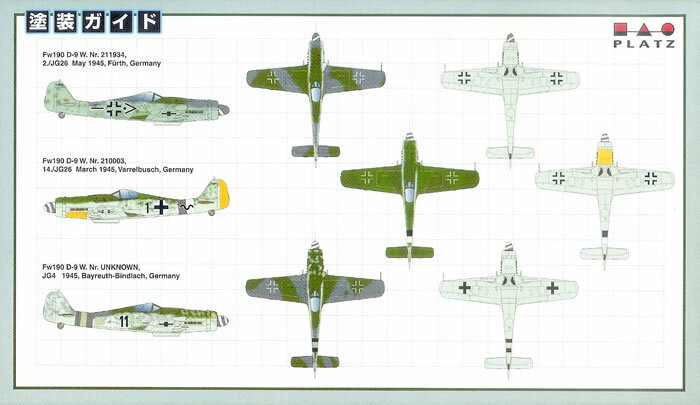 Two identical kits come packed in a good quality end-opening box with nice artwork on the front, and a painting and decaling guide for three of the six decal options on its rear. The remaining three decal options not covered on the box’s rear are catered for using black & white shaded drawings within the instruction pages. 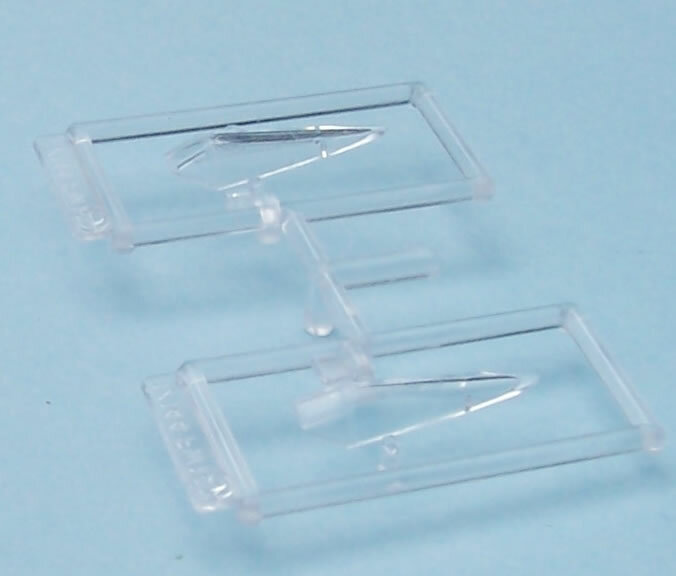 All parts are sealed in a plastic bag, with the clear parts sealed in their own separately. The decals are loose and covered with translucent paper. I’m all for encouraging young modellers, but the box-top endorsement “Not suitable for children under 36 months of age.” may just be setting the bar rather optimistically low! The instructions do not include a parts map, but this is of little consequence. 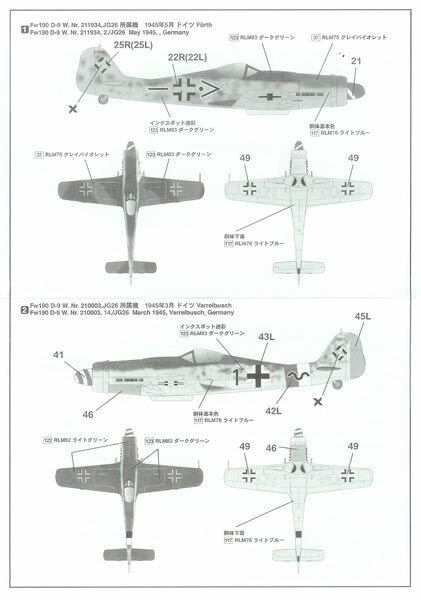 Assembly diagrams are easy to follow, but almost all text is in Japanese characters. However there are some RLM paint codes, and an English translation for decal option details regarding unit, date and place. 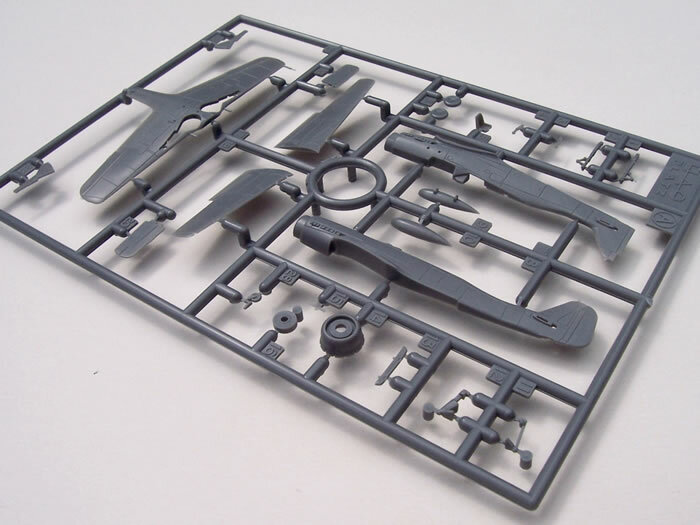 The kit follows a conventional breakdown for this type of aircraft and all parts are crisply moulded with delicate recessed panel line detail. The cockpit tub and instrument panel are formed as part of the two fuselage halves, into which a seat is inserted. Such is its small size that this very basic interior does not matter much. 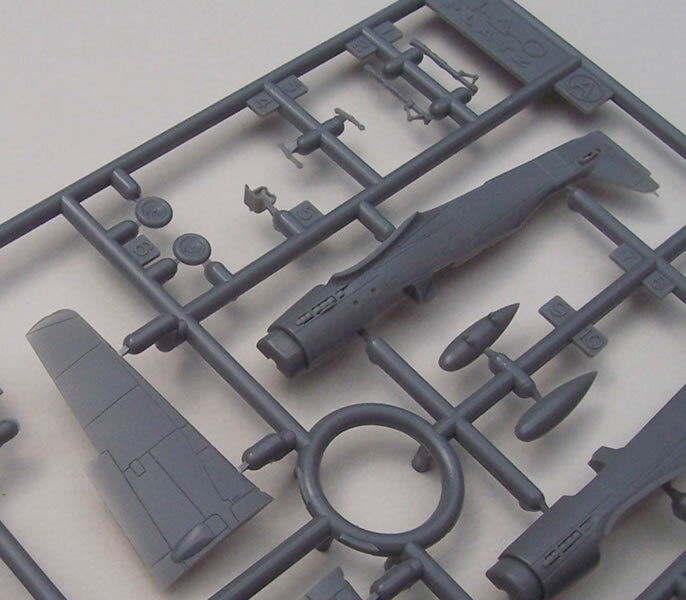 Where this kit shines is capturing the stunning lines of the real aircraft and high degree of moulding finesse. 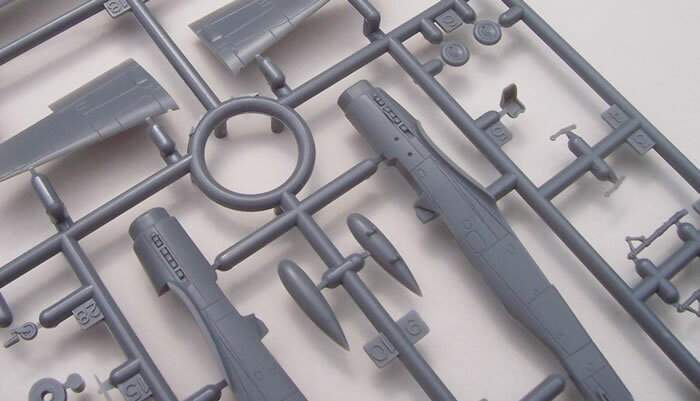 Yes, in theory panel lines in 1/144-scale are going to be overdone no matter how fine the moulding, but most would want something there to add interest to the model. Platz have done a very good job in this regard. The delicacy of the exhaust stubs and landing gear legs is superb, and the prop is very good too considering injection moulding limitations. The usual choice of flat or blown canopy styles is provided for, and the transparencies are commendably thin and clear. 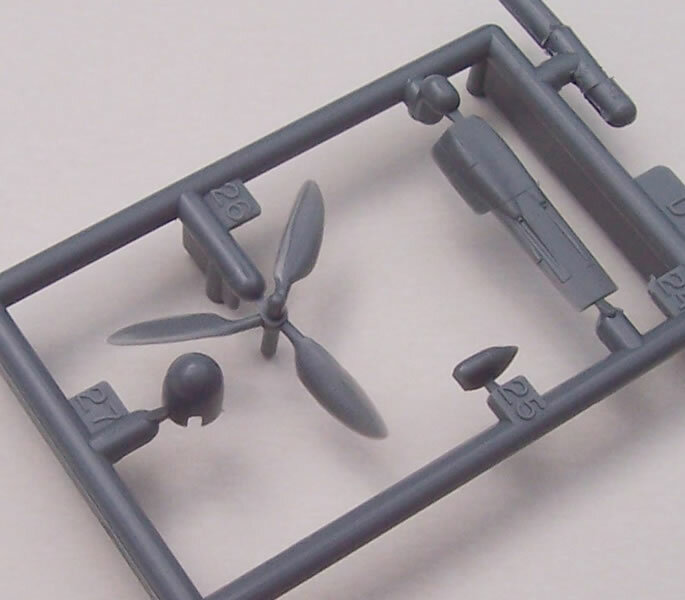 Assembly is conventional for the type and should be a breeze, which is more than can be said for painting when it comes spraying 1/144 scale mottle! No less than six decal options are fully provided for, along with stencils sufficient for two. There is a surplus of swastikas in the review sample because the sheet has both two-part versions for European market and single-piece ones for others. The single-piece swastikas are at the end of the sheet and easily removable for Europe. The decals look to be excellent, and like the rest of the kit are finely done within the limits of prevailing decal technology. 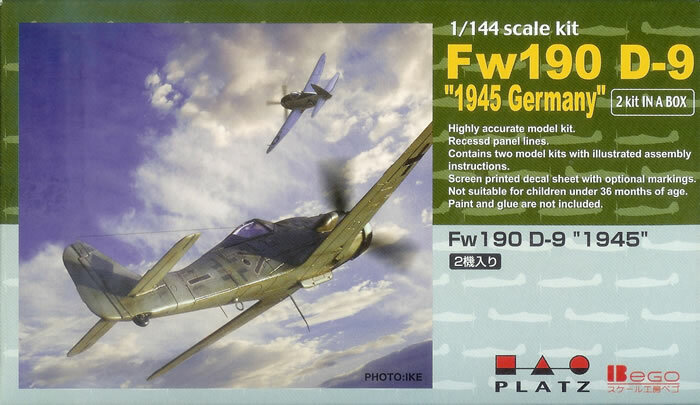 Given the small scale I might hesitate to use all of the stencils provided because I think that some could look over-sized on the model. . For information on decal options please refer to the images accompanying this article. 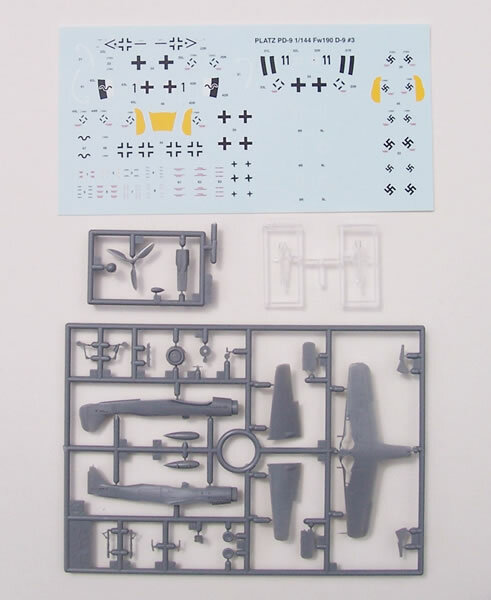 This boxing offers two stunning little Fw 190D-9 kits, and I think represent very good value. Platz’s moulding has so much finesse that I think the eye will be drawn away from any unavoidable slightly over-scale elements. These kits should be easy to build, but skill will be needed when painting. There will of course be those who choose to add more detail etc, but as supplied they are very good. Neatly finished these models are potentially little gems, and very undemanding on display space.